The bone marrow aspirate is replaced by hypergranulated abnormal promyelocytes (MacNeal Tetrachrome 100x). In addition to granules in the cytoplasm, some cells have characteristic folded nuclei (MacNeal Tetrachrome 100x). A 47-year-old woman presented for evaluation of pancytopenia. She had been diagnosed with papillary thyroid cancer 18 months earlier and underwent total thyroidectomy followed by radioiodine (I-131) ablation for nodal and small pulmonary metastases. Cumulative dose of radioactive iodine was 312 mCi. She had an excellent response to radioiodine therapy and remained in good health for the next year. One year after treatment with radioiodine, a mild decrease in the peripheral blood counts was detected during routine follow-up, although the levels remained within the normal range. Over the next 3 months, however, the blood counts continued to decline. Complete blood count (CBC) showed: white blood cell (WBC) count, 2.1 k/µl; hemoglobin, 13.1 g/dl; platelets, 147 k/µl; and absolute neutrophil count, 0.9 k/µl. A bone marrow aspirate and biopsy were performed and interpreted as morphologically normal without increase in blasts. Promyelocytes represented 5% to 10% of cells. Cytogenetic testing showed t(15;17) in 6/20 metaphases. After reviewing the bone marrow sample again, Auer rods were noted. One week later, the patient sought a second opinion and had a repeat bone marrow examination, which demonstrated 2% blasts and 25% promyelocytes (Figure 1). Many promyelocytes were atypical in appearance with folded nuclei. Karyotype analysis showed t(15;17) in 2/20 metaphases. Molecular diagnostic testing was positive for the PML-RARα transcript. Her CBC remained stable (WBC 1.9 k/µl, hemoglobin 12.5 g/dl, platelets 151 k/µl), and there was no evidence of coagulopathy or bleeding (prothrombin time 10.2 seconds, activated partial thromboplastin time 27.9 seconds, fibrinogen 245 mg/dl, D-dimer 204.00 ng/ml). She had no complaints. The diagnosis was acute promyelocytic leukemia (APL), most likely related to radioiodine exposure (therapy-related). When making the diagnosis of APL, promyelocytes are considered blast equivalents (eg, our patient had 2% blasts + 25% promyelocytes = 27% blast equivalents). 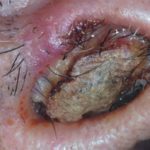 The patient was started on treatment with oral all-trans-retinoic acid (ATRA) immediately after her consultation. The following week, she was enrolled in a phase 2 clinical trial using ATRA and IV arsenic trioxide (ATO) with minimal or no chemotherapy for remission induction. After initiation of ATRA/ATO combination therapy, the WBC increased to 6.2 k/µl on day 5 (12 days after starting ATRA). Per the protocol, since the WBC had increased to ≥5.0 k/µl on day 5, idarubicin (12 mg/m2 IV every other day for four doses) was added to the induction regimen on day 5 because of the increased risk of APL differentiation syndrome in these patients. The plasma fibrinogen level decreased to a nadir of 104 mg/dl approximately 2 weeks into therapy, and she received 10 units of cryoprecipitate. No evidence of bleeding was present, and prothrombin and activated partial thromboplastin times remained within normal limits. The patient tolerated treatment well, and peripheral blood counts and plasma fibrinogen have subsequently normalized. A day 30 bone marrow examination to confirm complete remission will be performed, and she will proceed with the consolidation and maintenance phases of treatment. 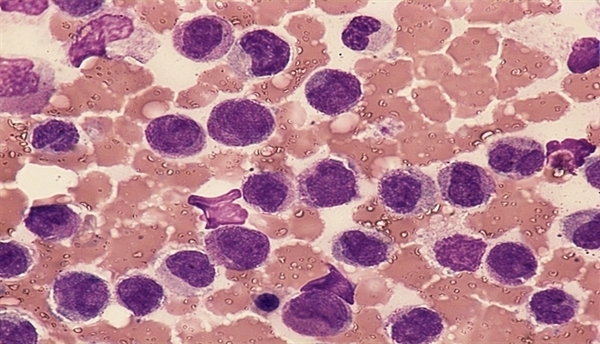 Therapy-related acute promyelocytic leukemia (t-APL) is a unique genetic subtype of acute myeloid leukemia (AML) characterized by a balanced translocation of chromosomes 15 and 17 and the formation of a chimeric oncoprotein, PML-RARα. This chimeric protein is a transcription factor that blocks normal myeloid differentiation at the promyelocyte stage, and its activity is disabled by the differentiating agents ATRA and ATO. Clinically, APL is a medical emergency due to the high risk of early death from hemorrhage; however, if APL is recognized and treated promptly, the disease has an excellent prognosis. t-APL is most commonly seen after exposure to topoisomerase II inhibitors, such as mitoxantrone and epirubicin, which cleave DNA and place patients at risk for balanced chromosomal translocations, such as t(15;17), t(8;21), and MLL translocations involving 11q23.1,2 The incidence of t-APL appears to be rising, likely due to increasing use of topoisomerase II inhibitors for malignancies such as breast cancer, and t-APL may represent up to 22% of all APL cases.3 t-APL after radioiodine therapy for Graves’ disease or thyroid cancer is rare, with only a few other case reports published.4,5 Therapy-related AML (t-AML) has also been described after exposure to radioiodine, with one series reporting 39 cases.6 In this study, patients who developed t-AML after radioactive iodine therapy fared just as poorly as patients with t-AML after exposure to cytotoxic chemotherapy or external beam radiation. 1. Mistry AR, Felix CA, Whitmarsh RJ, et al. DNA topoisomerase II in therapy-related acute promyelocytic leukemia. N Engl J Med. 2005;352(15):1529-1538. 2. Mays AN, Osheroff N, Xiao Y, et al. Evidence for direct involvement of epirubicin in the formation of chromosomal translocations in t(15;17) therapy-related acute promyelocytic leukemia. Blood. 2010;115(2): 326-330. 3. Beaumont M, Sanz M, Carli PM, et al. Therapy-related acute promyelocytic leukemia. J Clin Oncol. 2003;21(11):2123-2137. 4. Kolade VO, Bosinski TJ, Ruffy EL. Acute promyelocytic leukemia after iodine-131 therapy for Graves’ disease. Pharmacotherapy. 2005;25(7):1017-1020. 5. Grudeva-Popova J, Yaneva M, Zisov K, Ananoshtev N. Therapy-related acute promyelocytic leukemia after treatment with radioiodine for thyroid cancer: case report with literature review. J BUON. 2007;12(1):129-132. 6. Schroeder T, Kuendgen A, Kayser S, et al. Therapy-related myeloid neoplasms following treatment with radioiodine. Haematologica. 2012;97(2):206-212. 7. Duffield AS, Aoki, J, Levis M, et al. 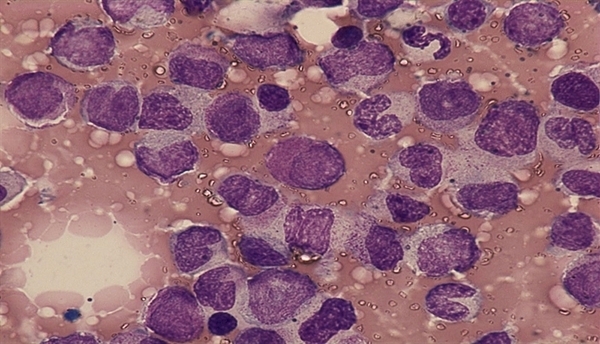 Clinical and pathologic features of secondary acute promyelocytic leukemia. Am J Clin Pathol. 2012;137(3):395-402. 8. Altman JK, Rademaker A, Cull E, et al. Administration of all-trans retinoic acid (ATRA) to newly diagnosed patients (pts) with acute promyelocytic leukemia (APL) is delayed even at experienced centers and associated with an increased early death rate (EDR): a retrospective analysis of 205 pts. Blood. 2011;118(21):abstract 942. 9. Iland HJ, Bradstock K, Supple SG, et al. All-trans-retinoic acid, idarubicin, and IV arsenic trioxide as initial therapy in acute promyelocytic leukemia (APML4). Blood. 2012;120(8):1570-1580. 10. Tallman MS, Andersen JW, Schiffer CA, et al. Clinical description of 44 patients with acute promyelocytic leukemia who developed the retinoic acid syndrome. Blood. 2000;95(1):90-95.